The Coopered Tot: Thomas H. Handy Rye is a fireworks display in your mouth. 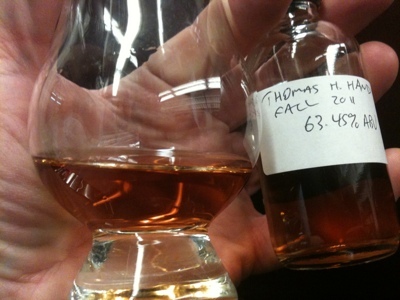 Thomas H. Handy Rye is a fireworks display in your mouth. "As Buffalo Trace is owned by Sazerac, and Sazerac was founded by Thomas H. Handy, it seems only fitting to begin a look at Buffalo Trace’s 2011 Antique Collection with the Thomas H. Handy Sazerac Straight Rye. The story begins (more or less) at the Sazerac Coffee House which was located on Exchange Alley in New Orleans’ French Quarter and was well-known for its cocktail made with Sazerac de Forge et Fils Cognac, bitters and absinthe. Handy purchased the Sazerac Coffee House in 1869, switching the Cognac to Rye whiskey in the 1880′s as the Phylloxera epidemic wiped out the supply of grapes for wine and spirits in Europe. Handy steadily built his spirits empire over the years, purchasing and marketing brands like Peychaud’s Bitters and opening another establishment, The Sazerac Bar. The actual Sazerac company was started by a former secretary of Handy’s, C. J. O’Reilly, but it was Handy who laid the groundwork and is generally seen as the father of the company." This straight rye whisky is made from a mashbill of Minnesota rye, Kentucky corn, and malted barley from North Dakota. 41 barrels of new American White Oak were filled and the spirit was aged for six years and five months before it was bottled uncut and unfiltered." Handy, at 6 years old is the younger of the two ryes in the Buffalo Trace Antique Collection (as Sazerac 18 is 18) and the youngest spirit in the collection overall. However it has a magnificent regal quality all its own. Color: a shade deeper and redder than new penny copper. More like old red copper, like a gem large cent that will bring tens of thousands at auction. It's a henna auburn color. Nose: like a mature sherry bomb Scotch. Noble, august, cognac-like jammy marmalade and cherry, fragrant sweet oak spice perfume. The big notes are jammy dried orange citrus with musky overtones and a sprightly dancing nimble cherry note above with a bit of sweetness and fruit acid zing. After 45 minutes or so of air caramelized sugars like a baked cinnamon candy apple lead off. What a rich and lovely nose. Entry is sweet and complex with bourbon peaches, cherry compote, crushed ivy and cilantro herbal note, floral vanilla oak, sandalwood incense, raging cinnamon spice heat and sawn rugged oak. Long air time (45 minutes to an hour ups the opening sweetness better here than adding water does - with no loss of intensity). Then the mid-palate expansion rocks these flavors into explosive overdrive. Vibrant cinnamon heat overlays a powerful coiling bittersweet herbal filigree. The turn to the finish sees the herbal notes take over from the sweet and transition into a bitter and medicinal eucalyptus or bitter almond note. The bitterness rides the finish into rich charred oak flavors and lingering ivy herbs at the fade out. This is a fresh rye palate of flavors yet seemingly paradoxically young and vigorous and aged, mature, and regal at the same time. How do they do it? If I hadn't had the William Larue Weller 2011 last week I would have said this was the most flavor density I had ever experienced in a spirit. Powerful Rye put me in the mind of Old Potrero - a rye with a powerfully herbal spicy rye kick. So I queued up a dram and sipped them head to head. It's not a fair fight as Old Potrero is diluted to 45% abv, and doesn't sport an age statement. I don't know how old Old Potrero is , but the fact that it is issued in uniquely labelled "Essays" - as indicated in labels on the neck - indicate that it is a small batch product of a single distillation run, rather than a vatting of different ages. Furthermore Old Potrero is, unusually for an American rye, made from 100% rye and malted rye at that. Old Potrero is a much gentler flavor on entry, sweet and clean and vegetal with a spicy kick that builds up over repeated sipping. The rich vegetal flavor is fresh and cleanly plant-like. 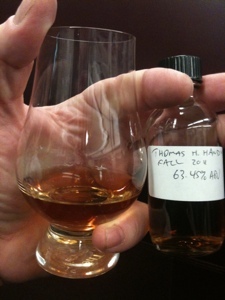 Thomas H. Handy is redolent of other flavors - with burnt sugar, cinnamon spice, cherry and other fruits and an almost smoky richness overlaying the powerful vegetal note. It's a far more complicated and richly flavored brew of sensations. Ultimately Handy is in a totally different league from a flavor density perspective. It's truly an incredibly dense flavored spirit. Amazing. Old Potrero's clean clear vegetal note seems a signature of it's 100% rye mash bill. However Handy's traditional mash bill is utilized to full effect with incredible complexity and intensity of flavor that delights and mystifies. How, indeed, does Buffalo Trace achieve such remarkable intensity of flavor in this 6 year old Rye? I think a lot of it is sheer luck. We're getting to see the absolute best of what Sazerac 6 Year can be, bottled at full strength. In a sense that's a loss to their normal 90-proof expression, but I'm glad that they pull these casks out and let us taste the miracle of aging in Kentucky. This also gives me hope for future releases of Sazerac 18 Year, as the rye they've been bottling for most of the 2000s has come from the same batch that's been sitting in steel tanks for the last handful of years. It has to run out some day, but Handy shows that BT has plenty more tricks up its sleeve. Thanks so much for commenting again, Jordan. Older ryes have a dicey row to hoe. They lose their heat and vegetal sweetness but gain softness, smoothness, and an august quality. They also pick up a ton of oak. Really old ryes risk being over oaked and losing the rye flavors. That's the hidden strength of Handy - but it might be a bit overboard. It's strong meat. In any case, it's a miracle of crafting solely from a flavor density point of view. But it's yummy and complex to boot. My biggest knock is that the finish is a bit bitter - but that's what comes of a titanic flavor profile. I'll take the bitter with the sweet. And yes, it's very encouraging for the future. Great review Josh! Since I'm running out of Rye at home, I will have to hunt this down. It sounds spectacular!